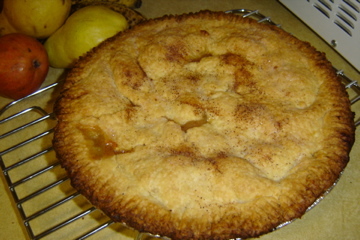 A tasty looking peach pie. Let's hope its looks aren't deceiving. I convinced myself that I was well-prepared. Nutmeg? Check. Flour? Check. Six plump peaches? Check. I had everything I needed to bake two pear pies, or so I thought. When my friend and I started baking pies at my apartment Wednesday night, we soon realized that I was missing measuring cups. I thought I had them in my new apartment, but alas, I didn’t. They’re one of many things I had to leave behind in my old apartment. So, we grabbed a 12-oz cup from my cupboard and guestimated our way through the recipe. Now, this isn’t the best idea when it comes to baking, but it was getting late and we didn’t have time to go to the store. When it came time to flatten the crust, we realized we didn’t have a rolling pin. Hmmm. I opened some of the drawers in my kitchen and looked for alternatives. A roll of aluminum foil. Perfect! It didn’t flatten the crust as well as we would have liked, but it worked nonetheless. When my friend tested out the pears, she puckered her lips. “These pears taste really salty,” she said. I tasted a pear and could tell what she meant. It was pretty salty. I mixed the pears and ingredients together some more, which helped a little. A little salt goes a long way, apparently. My friend and I baked pies at this time last year, and though I was worried we didn’t bake them correctly, they ended up being quite tasty. Tomorrow we’ll see if we can say the same for this year’s pies. I doubt people will tell me if they think my pie tastes bad, so I’ll be watching their expressions when they try it. I never said I was a baker, but I get some effort for trying, right?